Mid-nineties South Africa was both a charming and frightening place to be. There was the joy of having toppled the nationalist government of the National Party and formally moving past Apartheid once and for all but there was also fear. The African National Congress were not the only political party that had stood opposed to the National Party in the elections and there was fear that other, less moderate parties would mobilise to seek revenge for the years of oppression and inequality under Apartheid. There was also a concern that right-wing extremists might stage attacks or insurgencies and this was not unfounded either. The right-wing, neo-Nazi party Afrikaner Weerstandsbeweging had staged an armed attack on the multiparty talks between the NP, ANC and other parties in December 1993 and they assured the public that they would violently oppose the new regime. It was a time of confusion and uncertainty. People did not know what to expect and were frightened of reprisals or at least radical reparations. Yet in the aftermath of the democratic elections, the first in South Africa to feature universal franchise, the lone voice of Archbishop Desmond Tutu rose above the chaos and said that the people of South Africa must draw together as one rainbow nation. This was repeated by former President Nelson Mandela on his first month in office when he uttered the immortal words "Each of us is as intimately attached to the soil of this beautiful country as are the famous jacaranda trees of Pretoria and the mimosa trees of the bushveld - a rainbow nation at peace with itself and the world". It seemed inconceivable, impossible even that a man imprisoned for 27 years for treason against a brutal, racist regime could emerge and speak not of revenge, hatred and reprisals but of unity, tolerance and peace. Yet here was Nelson Mandela preaching exactly that and he began the process that would leave a mark on the life of every South African. 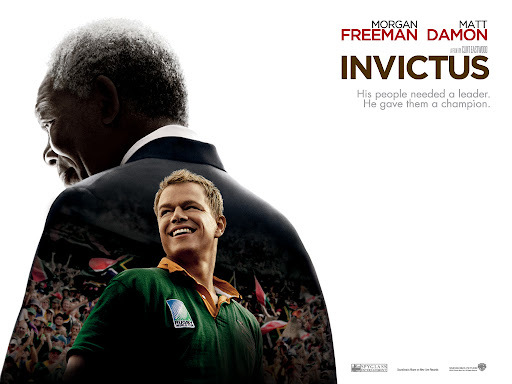 Invictus was directed by Clint Eastwood and stars Morgan Freeman as Nelson Mandela and Matt Damon as the captain of the South African rugby team, Francois Pienaar. The film begins with two boys’ rugby games divided along racial lines. It is the day Nelson Mandela was released from prison on 11 February 1990 and in the first five minutes of the film, we move swiftly through the events leading up to the elections and Mandela’s inauguration as president. Actual news footage from the time is used and gives an authentic feel to the massive change that was sweeping across South Africa in that time. 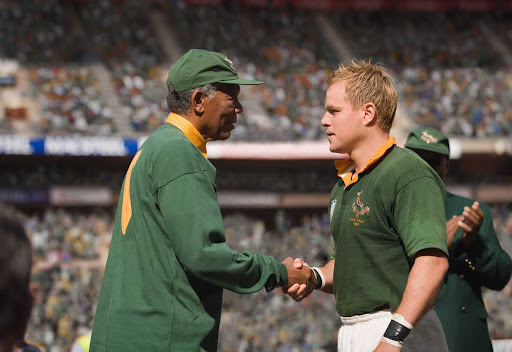 Invictus tells the story of Mandela’s first fourteen months in office and how he used the game of rugby to unite a divided country. I would not say that this is strictly a historical or political story but neither is it just a film about rugby. 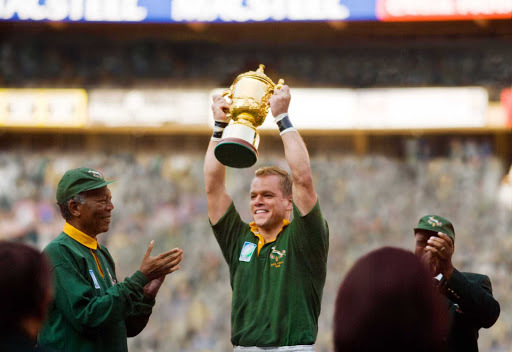 It the the true story of how the South African rugby team beat all odds to become the winners of the 1995 Rugby World Cup and how rugby itself went from being a pariah, an Afrikaner sport to a game that the whole country supported. Several creative liberties were taken in the making of the film and indeed, Mandela did not give Francois Pienaar the poem “Invictus” by William Ernest Henley but rather a portion of a speech by Theodore Roosevelt. On the whole though, the film is extremely authentic and the fashions, attitudes and accents of the time are all really well done. They used a large South African supporting cast in the film and shot in several locations across South Africa. 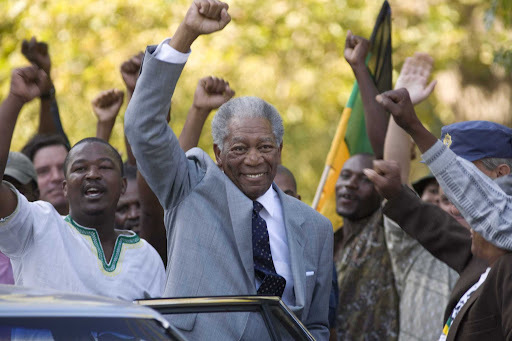 Morgan Freeman was good as Nelson Mandela and he seemed to capture a lot of Mandela’s mannerisms. He made a good effort at Mandela’s unusual accent too although his own American accent seemed to dominate. 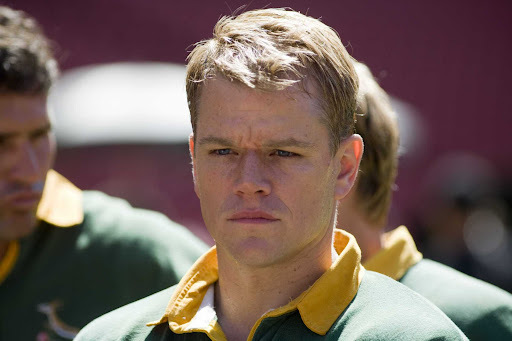 Matt Damon was superb as Francois Pienaar and I could not fault him in his performance. He played with conviction and passion and accurately portrayed Pienaar’s slightly reserved yet powerful persona. The rugby scenes in the film were extremely well done and several famous plays were depicted. The fever pitch of the final on 25 June 1995 was conveyed brilliantly from the Boeing flying over the stadium with the good luck message to the Springboks (although it wasn't quite as illicit as the film made out) to the people hugging in the streets afterwards. That kind of reaction is not unknown in South Africa and people once again left their cars and took to the streets in celebration when South African won the Africa Cup of Nations in 1996 and in May 2004 when it was announced that South Africa has been voted host nation of the 2010 FIFA World Cup. Critics have questioned the accuracy of the film and whether one sports game could have made such a difference in a country divided for years. I believe that the film does go some length to showing that it wasn’t just the game of rugby or the ambition of Nelson Mandela. It was a time of reconciliation and forgiveness and was in fact followed in 1996 by the Truth and Reconciliation Commission into human rights violations under Apartheid. Invictus is an incredibly inspiring film based on an equally inspiring man and true events. Through great actors and his hallmark attention to detail, Clint Eastwood has brought a magical moment in history to our screens. This is a touching film and certainly deserved the several best actor, best supporting actor and best director wins and nominations, most notably the Black Reel Award for Best Actor in 2010 for Morgan Freeman. 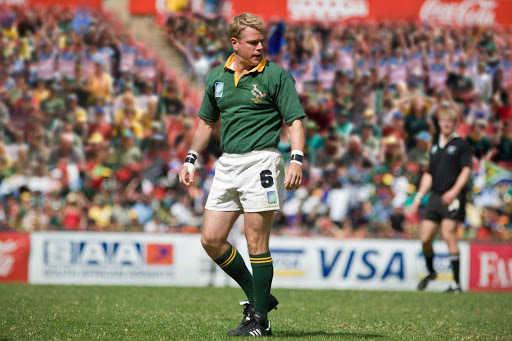 Francois Pienaar stated in an interview this week that he cried the whole way through the first screening of the film and I can certainly understand that. The film is emotionally charged throughout and extremely powerful. While the film is excellent, the extra features on the film are mildly disappointing. 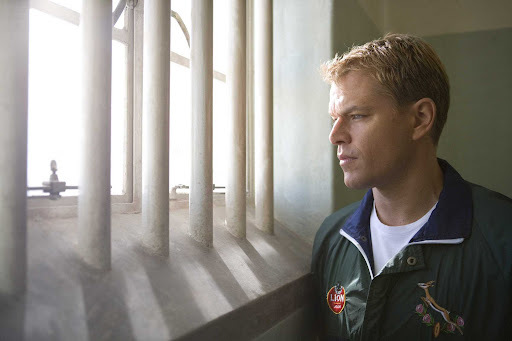 They feature an Invictus music trailer and a six-minute featurette “Matt Damon Plays Rugby”. The features on the Blu-ray release are far greater and given the superior audio and video quality of Blu-ray, it might be worth moving over to that format. 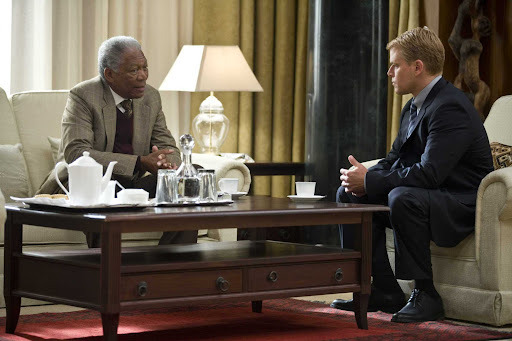 Deducting points only for Freeman’s slight difficulties with Mandela’s accent, I give the film four-and-a-half stars. Article first published as DVD Review: Invictus on Blogcritics. I was considereing watching it over the weekend. Guess I shall! Thanks for the review Emm! @ Usha: Did you watch it?? Did you like it?? I watched the film earlier this week, and I absolutely loved it. It's great to read your review for these details. The differences between the film and real life were most interesting. I'm truly shocked that the poem Invictus was not part of the actual events! @ Forrest: I'm so glad you liked it! !